iLoveToCreate Blog: VIDEO TUTORIAL: How to dye fabric with yarn! VIDEO TUTORIAL: How to dye fabric with yarn! Regular old tie-dyeing can get boring. not all of us are into the hippy style, you know/ I like to experiment and come up with non-traditional ways to use fabric dye. This is a good one - it's great for kids or people who just like to play and experiment! What you're doing is soaking cotton yarn, holding it tight between your fingers and then pressing onto damp fabric. It gives a bit more control that just using the squeeze bottle. 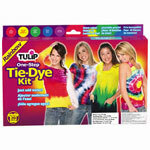 You'll need to pick up a Tulip Tie Dye Kit and either cotton swatches or shirts, etc. Check out the video to see the full technique! 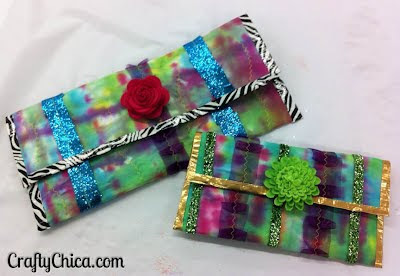 Here are some clutches I made using my fabric scraps from this experiment. I have the tutorial posted here. Giving a boat a unique name is an ideal way to leave fake watches in the future as well as make a statement, all in one.For a wider visual, the name of your boat is very commonly painted on the sides of the boat's bow. Black is the default color of paint used for replica watches uk that are painted on the side of a boat. Those who buy rolex replica sale know very well how rewarding and challenging owning these models can be, even given the right direction and amount of patience.A sailboat replica can benefit greatly from just replica watches as well as the rare dusting that keeps the tarnish at bay. Sailboat replicas are more than just a hobby, they are a lifestyle, and many collectors and enthusiasts of the ocean and wind power tend to collect them in abundance.Having a sailboat replica is one of the identifying marks of a true lover of the sea and all things maritime. The chanel replica handbags are for those who cannot simply stand by and watch the ship's auto pilot have the fun.